Some homes collapsed and a school suffered serious damage on Kadavu at the height of Tropical Cyclone Keni, it was revealed last night. Anare Leweniqila, director of National Disaster Management Office (NDMO), said Kadavu appeared to be the worst hit. TC Keni packed winds up to 185km per hour. Prime Minister Voreqe Bainimarama said yesterday: “We have received reports of damage from the school in Vunisea and homes in Kadavu. At 5pm this afternoon TC Keni is still very much in our waters, so there will be damaging winds. TC Keni did not make landfall, but was 60 miles east south east of Kadavu. It was moving away last night. Mr Leweniqila said they would send an assessment team to Kadavu as soon as the weather permitted. He said they did not have details of the damage. Commissioner Eastern Luke Moroivalu confirmed receiving a report that some houses had gone down. “The last report I received from the village was some dwelling houses had fallen,” he said. 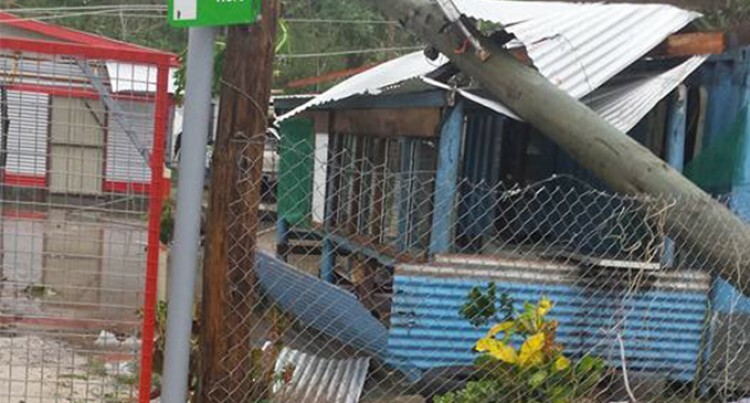 In an earlier interview before TC Keni hit, the headman (turaganikoro), Kalivati Tukutukulevu, said the village was prepared and they had eight evacuation centres including the village hall. He said they were experiencing strong winds and they were prepared for the cyclone. “Villages of Ono, Buliya, Dravuni and Kokomo have been told to move to their evacuation centres,” he said. Anare Leweniqilaational Disaster Management OfficeKadavuPrime Minister Voreqe BainimaramaTropical Cyclone Keni.